Bad Advice = Bad Lawyer? As a practicing attorney you are always learning from each case, each client, each Court appearance, and dealings with opposing counsel. Through all of this, there are memorable lessons learned and some you wish you had not. Some memorable milestones are your first Court appearance, your first argument before the Court and the first satisfied client. I recently experienced a “milestone” that I wanted to share. I was involved in a case where I “knew” who the other attorney was before he was “hired.” I knew based solely on the conduct of his client; destroying property, taking things that did not belong to him, damaging other property, having a poor attitude and ignoring attempts to communicate amicably and to resolve the outstanding issues without things escalating. I have this theory that clients tend to seek out and hire attorneys that are similar to themselves. Now, obviously this is not always true and too broad a generalization to make, but fitting for this instance. In any event, this other party decided to do some bad things. As soon as I heard of the destruction, I said “I know who his attorney is.” It was not a good feeling. I was not proud of myself. I was disappointed that due to this conduct that I “knew” who he hired. This conduct and this advice is exactly why people hate attorneys and think we are lower than low. So what did I do about it? Well, I tried to do the best I could. Set it for hearing and let the Judge have a say. The client may or may not have broken the law, but that didn’t make it right. This milestone, unfortunately memorable, of knowing who the other attorney is by offensive conduct of his client actually reminded me that I do not ever want another attorney to “know” that I am involved in a case based upon offensive conduct of my client. Want to share to some war stories? Leave a comment or send an email, maybe I’ll blog about it. 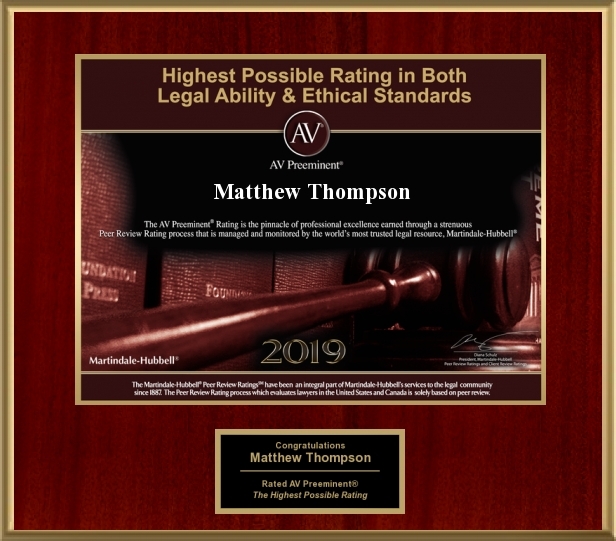 Matthew Thompson is a Family Law attorney and strives to do what is right and is now getting off of his soapbox. I know exactly what you mean and I have had those moments numerous times. And I can probably tell you who the lawyer is that you identified.